Home :: Haitian Metal Art :: Recycled Metal Drum Art :: Giraffe, Haiti, Folk Art, Recycled Oil Drum Wall Sculpture, Indoor and Outdoor 6 1/2" x 32"
Giraffe, Haiti, Folk Art, Recycled Oil Drum Wall Sculpture, Indoor and Outdoor 6 1/2" x 32"
Though it is protected with a weather-proof finish, this sculpture will rust over time, if exposed to outdoor weather. To prevent this from happening, grab a can of spray on enamel at the hardware store and go to it. Once a year should be plenty. It's a snap! It's easy to hang your sculpture with just a few nails. Place the first nail within two design elements that are touching or notched. Then use a second and possibly a third nail, if the sculpture is large, to straighten and secure the piece against the wall. Just make sure that you don't place a nail in an eye or a mouth. A viewer's attention will go there quite naturally and therefore, directly to the nail. You don't want that! 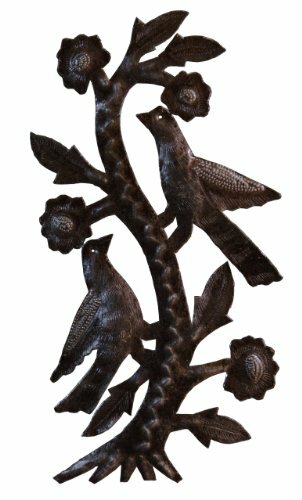 Each unique fair trade metal sculpture is hand- cut from recycled 55- gallon steel drums. To begin the process, both ends of the drum are removed and placed inside of the remaining cylinder, along with scrap paper and dried banana or sugar cane leaves. Next, the contents are set ablaze to burn off any paint or residue and strengthen the metal. When cooled, the drums are sliced down the side and flattened, effectively creating a "steel canvas" of approximately 3' x 6', upon which the design is drawn. 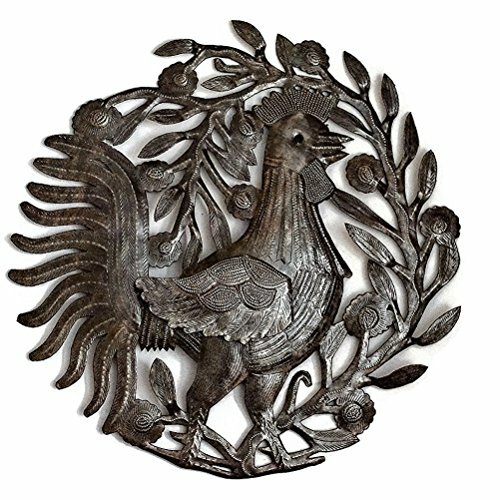 Using a hammer, chisel and various other primitive tools, the desired image is cut out and decorative patterns are pounded into the metal. 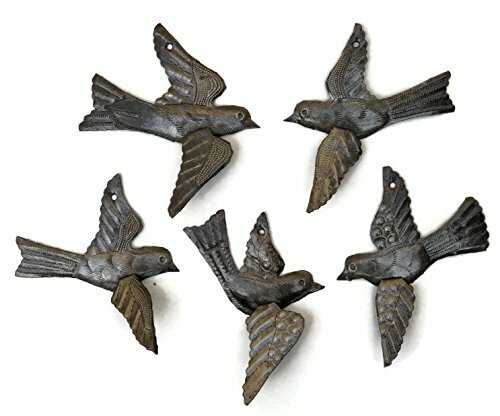 Finally, a weather-proof finish coating is applied, making these fascinating pieces of folk art perfect for displaying indoors or out.